TURQUIE – Alabanda - A marble sculpture head of Artemis from the fourth century BC has been uncovered in the ancient city of Alabanda (also known as Antiochia of the Chrysaorians) as the archaeological excavations there come to a close. In some of the excavations made at the site, the doors of the ancient city were uncovered, the head of the excavation team, Aydın Adnan Menderes University Archaeology department academic Suat Ateşlier said. The walls from the Byzantine era were also found, he added. These walls and the road were uncovered near the Temple of Apollo, said Ateşlier. “We have also found a very valuable sculpture head in the same area. The quality of the sculpture is very good, and it is in very good condition. This is a goddess sculpture.” He added that experts believed it was of the goddess Artemis, the sister of Apollo. Ateşlier said they had started in July and this season many newly excavated artifacts has been uncovered at the site. The team closed the excavations on Dec. 20. This year also geophysical analysis was done in the area and another goddess’ temple was found, added Ateşlier. The location of the temple was determined, and next year the excavations will be done in that area, he said. The site is located in Çine, in what is today the Turkish province of Aydın. MEXIQUE – Cholula - The skeletons were discovered as the archaeologists supervised the installation of a new drain in an old neighborhood of Cholula, a city located 120 kilometers north of the Mexican capital. The first skull was found at the site on December 8 and by Thursday, the experts had identified the remains of 12 individuals. They were found buried just a few centimeters below a paved section of asphalt, said archaeologist Ashuni Romero Butron, who added "fortunately they were not damaged by erosion before the paving." He said most of the 12 skeletons are complete, and their sexes will have to be determined in laboratory analysis. The ethnic origin of the bodies is also yet to be determined, though Romero noted that 800 years ago the area was home to people from the Tolteca-Chichimeca and the Olmeca-Xicalanca cultures. 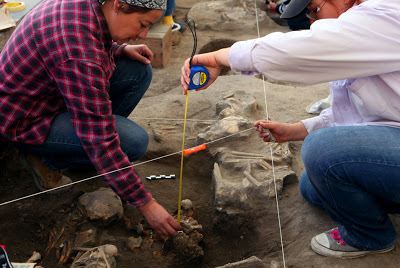 Last April, another burial site with 17 skeletons, some 700 years old, was found nearby. 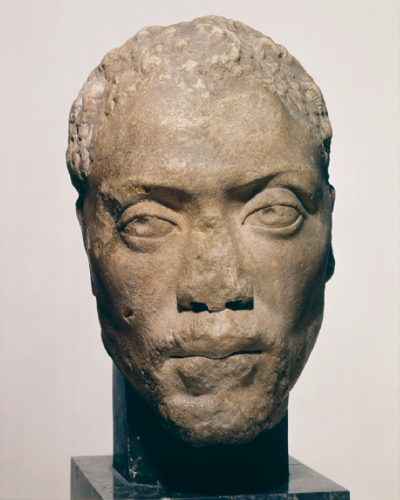 GRECE – Thyreatis - This marvelous bust is one of the very few documents of an actual black person from Greek and Roman antiquity. Memnon was a pupil and protégé of the well-known Athenian entrepreneur and philosopher Herodes Atticus. It was found more than a century ago in one of several villas owned by Herodes, and it adds a face to the name of the person recorded by Philostratus in his Lives of the Sophists, an account of the famous philosophers of the second century. The exact circumstances of Memnon's entry into this celebrated milieu are unknown, but there is no doubt about the esteem in which he was held. He was given the sobriquet "Memnon" in reference to the Ethiopian ally of the Trojans in Homer's Iliad. Philostratus and other sources record the extreme grief manifested by Herodes upon the early death of Memnon. An interesting aspect of this head's modern reception was its initial characterization as that of a savage hunter, constantly aware of his natural environment but incapable of abstract thought. Once the association with Herodes' Memnon was made, however, the ideal of the noble savage was replaced by the perception of a great character of introspection, even melancholy. USA – Louisville - The Hatfield clan New Year's attack on Randolph McCoy's cabin marked a turning point in America's most famous feud—the homestead was set ablaze, and two McCoys were gunned down. Hatfield family members and supporters were soon thrown in jail. Artifacts recently unearthed appear to pinpoint the location of the 1888 ambush in the woods of Pike County in eastern Kentucky. Excavators found bullets believed to have been fired by the McCoys in self-defense, along with fragments of windows and ceramic from the family's cabin. "This is one of the most famous conflicts in American history, and we've got bullets fired from one of the key battles. It doesn't get any better than that," said Bill Richardson, a West Virginia University extension professor who was part of the recent discovery. The bullets were discovered burrowed several inches into a hillside overlooking where the McCoy cabin stood, Richardson said. Three different calibers of bullets, including shotgun pellets, were uncovered. The ammunition, found in an area about 30 feet wide, was traced to the same time period as the 1888 battle, Richardson said. "The front of the cabin faces almost directly at the spot where these bullets were," Richardson said. "We know from the oral histories that they were shooting out the front of the cabin and from the upper windows. So they're exactly in the spot where they should be." INDE – Odisha - Chance-discovery of a 4-foot Buddha idol from a rock-cut cave of a hillock that demarcates Kendrapara and Jajpur districts of Odisha shows the rich Buddhist heritage legacy of this region. Researchers on Wednesday said they stumbled upon the idol firmly ensconced inside the cave of Parabhadi hillock near Derabish block of Kendrapara district recently. The Buddha idol under mistaken identity of a Hindu divinity is being worshipped by local migrant tribal settlers living along the fringe of the hillock. “The enchanting rock-cut idol of Buddha in Dhyana mudra or meditative posture facing southward was found on a rectangular piece of rock inside the square-sized cave of 18 foot length and width,” said Harish Chandra Prusty, researcher and principal of government-run Derabish college. Lord Buddha wearing divine look is seated on lotus petals with meditative postures. The rock-cut idol resembles the ones unearthed and preserved in Buddhist heritage sites of Udaygiri and Langudi in Jajpur district, he said. The idol establishing the rich Buddhist legacy of the place has turned into the presiding deity of tribal settlers. The chance discovery of the idol is not far away from famous Lalitgiri-Ratnagiri-Udaygiri Buddhist heritage sites now protected by Archaeological Survey Of India (ASI). There are numerous sites in both Kendrapara and Jajpur district which have immense treasures of Buddhist heritage and legacy. But these places are still lying unexplored. “The idol found in rock-cut cave might be dating back to 9th Century AD when Somavamshi dynasty ruled the then Kalingan Empire. Buddhism flourished under Bhaumakaras and Somvamshis during 7th to 9th Century AD. With disintegration of these dynasties, Buddhism declined. But rich archaeological wealth of its culture are intact,” said former superintendent, State Archaeology Department, Bijoy Kumar Rath.